Ooo... really nice. Would you mind if I featured this on the homepage for a bit? Looks great. What brand of flours are you using(and/or where purchased)? Never mind. I'll assume the same flours as your last similar thread. T85 is from Farmer Ground..
T85 is from Farmer Ground...its a small stone ground mill in near Ithaca. Beautiful loaf! The breads I just got from Tartine Bakery were all quite sour, even the Country. weird! i've only had their bread once and it was perfect, but i've heard similar stories. Looks like the long cold risk did the trick. I'm guessing that crumb is from the short proof based on the cuts. How was the crumb on the other loaf? Is this a T3 formula or a spin off from T3? 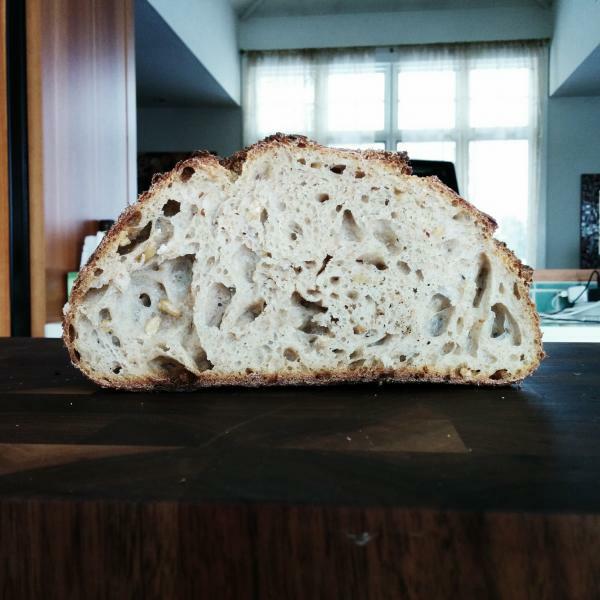 thanks josh- actually the crumb shot was from the long cold proof. The warm proof didnt have as much spring to it but it was still delicious. i guess its a riff on the T3, the sprouted kamut and germ in the bread was from T3. You mentioned sprouted Kamut berries in your formula. Do you sprout them yourself (i.e. soaking for a day or so) or you purchase sprouted and cured Kamut? I have whole Kamut grain, was wondering if I could just sprout it myself. If it's home made, do you cure the berries before baking or using them wet/soaked? Thanks! The 20-hr loaf looks outstanding. I can't wait to try it out. yea i sprouted them myself. rinse a bit and then soak in water for 6-7 hours or so. then drain and rinse and mix around a bit. repeat a few times a day till they sprout. i used them somewhat wet. i didn't dry them out or anything but they werent soaking wet either. i'd recommend sprouted rye berries over the kamut. the kamut was very good, but the rye berries are excellent. they are unexpectedly sweet and delicious. Awesome.. I am working on making red rye malt, so I have a whole batch of newly sprouted rye berries at the moment. Will definitely try that! Thanks! In general, how does one use sprouted wheat berries in bread making? I just received a box of Einkorn berries and I want to try sprouting them and using in bread but not sure what they should look like when the sprouting is "ready" for baking. I assume they will open up and show a little green or yellow... then you just drain, dry and roll into your dough during bulk rise. Can you help with some tips? One more question: for a 600 gram loaf of bread, how much grain should I sprout? hey ken- once they start sprouting you will know. i think they are ready when the sprout is about half to full length of the actual berry. anywhere in that range should be fine. then i dried them off a little bit and added them into the dough during the bulk. I think you can add up to 25-35% by bakers percentage and should be fine. lemme know how it turns out! 600 gm loaf with my Einkorn sprouts once they get going. I started them today and will refresh the water before calling it a day. Once, they sprout, I'm going to the oven with them... i.e., i'll start my bread making process. Something we all strive for when baking. 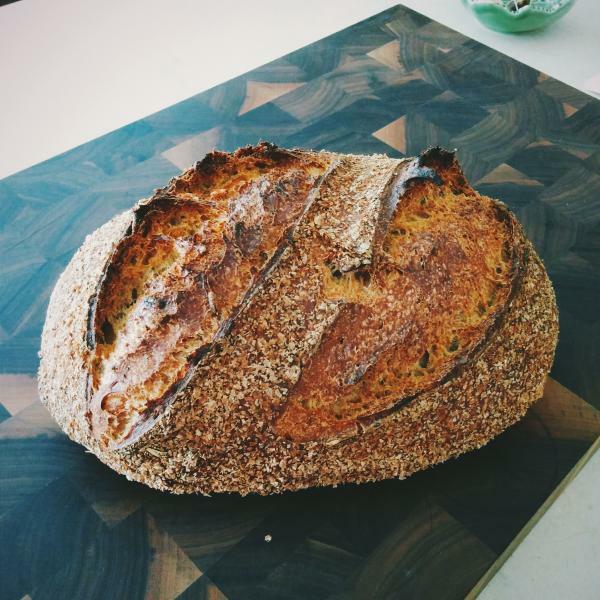 I used Einkorn grain for sprouting and substituted the Spelt flour with freshly milled Einkorn flour. I spouted or attempted to sprout Einkorn berries. For 4 days the sat in water, I rinsed twice a day and still they did not really sprout too much. Some had a little white root, but most did not sprout. I used them anyways since they were all soft and tasty. I substituted Flaxseed meal for Wheat Germ, and KA White Wheat for T85 flour. For kicks, I added some Coriander seeds, maybe 2 tablespoons and based my percentages on 600 grams of flour. 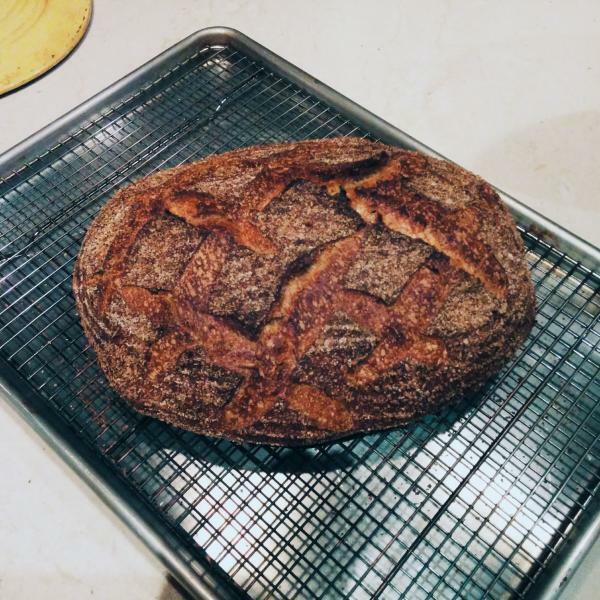 I used Tartine basic bread method to bake my boule in a Cast Iron Dutch Oven. Results: Easily one of the best tasting breads I've ever created. Problems were with the wheat berries and coriander seeds that became hard as rock on the outside crust. These are the kind of things that can break molars. I think the Tartine bread baking (500 F.) might have been too much. The bread was very hydrated during bulk rise and in general, did not rise as much as other breads, but that was to be expected because of all the whole wheat. Probably need to redo this receipe in the near future. Any suggestions on how to bake? I probably will not use whole coriander seeds but will use crushed ones instead in the future. Also need to get my sprouts working. The house has been colder lately, perhaps that is why they are not sprouting as expected. I have been having a similar issue with that. I'm wondering if its because of the lack of steam from the dutch oven? I dont really have any suggestions, I've been looking for an answer myself.....perhaps someone else out there can help out??? regarding the sprouting...they should only sit in water for 8 hours max. then you drain. twice a day you rinse and drain. I know some things sprout easier than others. also sprouting will occur faster at warmer temperatures so that could be why. I just started my berries soaking!!! I will rinse and drain tonight. I hope someone can give us some help on how to get the grain to sprout. I want to try again, perhaps reduce my whole white wheat and go with more KA Bread Flour. Also may add some walnuts for flavor. I found walnuts really can make a difference in the overall flavor or the bread that I like. The crust you have on the long proved loaf looks insanely good! Does the bran you used as a coating add crispness? thanks! yea it added some crispness and flavor. plus is looks good! P.s. Did you line your basket with the bran, or do you add on loading? the bulk proof or the final proof? I'm assuming the later? Beautiful bread -I love the crumb shot! I'm curious how the 2 differed. Was the 3 hour proof a lot less hole-y? How did you bake it? I have some spelt flour left over from a kid's field trip to a mill. I'd love to try this bread. Is it really 78% hydration? I start having trouble around 65%. How did you handle it? What temp did you bake it and for how long?